← The San Diego County Fair is back! 1992 Toyota Pick-up. 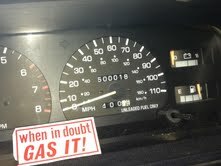 500,000 miles, is extremely unusual for a vehicle. While the material an engine is made out of, how well it’s built and how it’s driven all affect how long the engine will last, engine longevity usually comes down to one thing: maintenance. Toyota of El Cajon spends on average $2k a year per technician on training and certifications. They receive training directly from the manufacturer, Toyota of El Cajon, and off-site classroom. They use the latest equipment and diagnostics. Toyota of El Cajon’s technicians understand the nuances of combustion and what keeps a vehicle in peak operating shape.